It seemed like New Year’s had just passed, Sophie and I having just stepped off the plane from London, when I was already anxious for another getaway. During New York winters, I find myself often lost in conversation about warm comforting stews and trips to places that are warmer than my city where I don’t have to eat stews, trips I will likely never take. But I wasn’t alone in my fantasies this time, and by January 3rd I had an email in my inbox from Sophie ready to plan a weekend escape to her parent’s ski cottage in Vermont. For MLK weekend, ten of us packed our gators, ski mittens, and whatever board game we had in our possession and headed for the slopes. I went up a day later than the rest, and when I called Sophie from the car, she asked that I let her know when we were close so she could tell the boys to throw the steaks on the grill. I told James, who was driving, to go faster. When we arrived there was a fire raging, and the little house smelled like garlic and melted butter. Sophie put mugs of freshly brewed beer in our hands, thanks to a pit stop at a brewery in the Berkshires, and we settled by the fire while the boys slaved in the kitchen. I was happy to see my hostess employing one of my favorite weekend-away cooking strategies: pick up some meat, and invite enough guys that there will be an alpha male in the group who’s competent and willing to grill it. In this case, she was lucky enough to have Keith, who, upon arrival, began mincing garlic for the marinade and scalloping potatoes for a gratin—the dish responsible for that wonderful smell of garlic and melted butter. Soon dinner was on the coffee table in front of us, and after a bite of perfectly cooked steak, I relaxed. 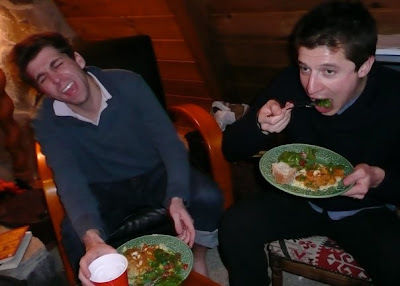 The next day we skied all morning and returned to the cottage for a lunch of leftover steak sandwiches, cold cuts, and grilled cheeses, expertly pan-fried by another male participant in the group, Ed. We stayed in for the rest of the day playing games, napping, reading, and watching the Jets win. Soon, it was time for dinner again, and this time the girls had it under control. To take some of the delegating and hosting responsibilities off Sophie, I volunteered to bring a stew, since that was apparently all that was on my mind in New York. I packed a revamped version of this Sweet and Savory Moroccan Chicken Stew I was testing for the book into a large Tupperware container, and loaded its garnishes into little plastic baggies. Steph had brought all the salad makings for the weekend and got to work slicing cherry tomatoes and avocado. Sophie mixed together an easy goat cheese spread to slather on top of crispy crostini, which the boys ate by the fire while the stew reheated, the couscous cooked, and the No-Knead Bread Cara and I had made together on our retreat (or rather, she made while I watched) got hot and crusty again in the oven. 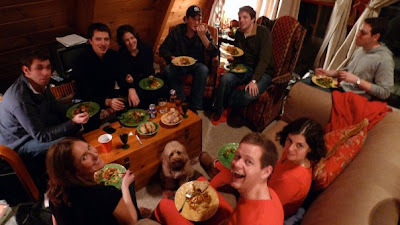 We ate the comforting stew until we could barely move off the couch, and everything we didn’t manage to clean off our plates was happily consumed by the 11th and 12th members of our group, the dogs. 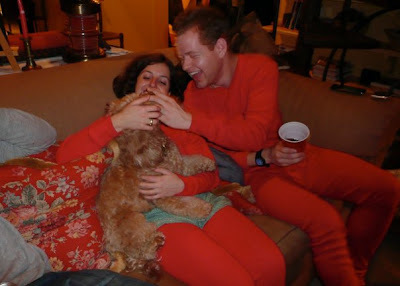 Mark and Lauren showed off the red one-piece pajamas they had picked up earlier that day at the Vermont country store. 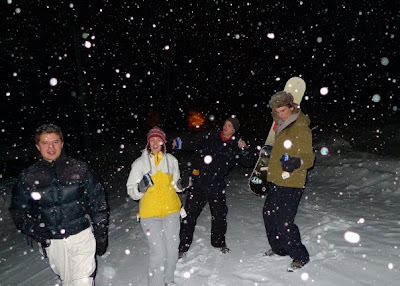 Then, full and delusional, we put our ski clothes back on, and ventured out into the fresh snow to sled on snowboards and throw mounds of powder in each other’s faces. When we returned at 1am, Sophie put half of her oatmeal cookie dough (the other half had been eaten raw the night before) in the oven, and we enjoyed warm, freshly baked cookies with our 2am nightcap. The next day, we reluctantly returned to the city with empty Tupperware containers, soaking wet sweaters in plastic bags, many bruises, and a plan to do it all again. If you intend to cook them….heat oven to 350°F. In large bowl, combine butter, sugars, egg, vanilla and beat on medium speed of electric mixer until creamy. Add flour, baking soda, cinnamon and salt; mix well. Add oats and raisins; mix well. Drop dough by rounded tablespoonfuls onto greased cookie sheets, I use a small ice cream scoop, it makes for well proportioned cookies. Bake 7 to 9 minutes until the cookies have poofed and are slightly undercooked. don’t let them fall and flatten while they’re in the oven, unless you want crunchier, drier cookies. Mix together the ingredients for the goat cheese in a small ovenproof bowl. Season with salt and pepper to taste. Bake for 15 minutes, until the cheese is hot. Arrange the baguette slices on a cookie sheet and drizzle with olive oil. Bake with the cheese for 5 or so minutes, until lightly toasted. Arrange baguette on a platter around cheese. oh my goodness .. this all looks amazing! so jealous of your weekend away – will definitely be trying those oatmeal cookies soon! It seems that you left out an ingredient…1 tbsp dried ?? ?